Lifeguard discovers cooler floating on a northern beach, realizes it's a pipe bomb. A lifeguard at a Haifa-area beach on Wednesday morning found a pipe bomb floating in the water, 300 meters from the beach. 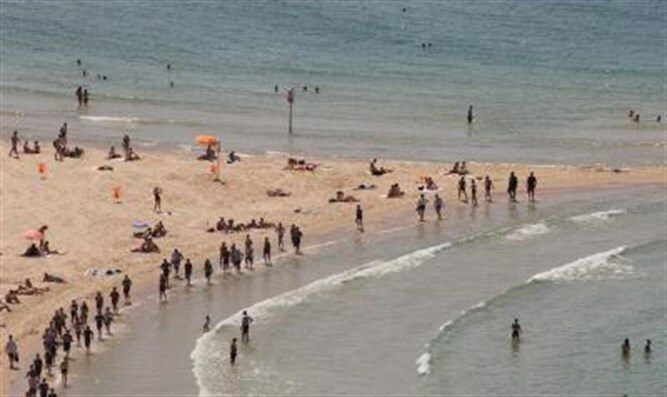 Liad Bar, 35, a lifeguard at the Haifa-area Kiryat Yam beach, was watching the ocean when he spotted a cooler floating on the waves. Upon investigation, the cooler was discovered to contain a pipe bomb, made of a pipe connected by wires to an old cell phone. The pipe itself seemed to be loaded with explosives. Bar immediately threw the cooler back into the water and distanced a large group of children from the area. He then called Israel Police, who arrived at the scene and safely eliminated the threat. "I was about to get on my surfboard when I saw a blue bag and a cooler floating on the water. I saw that the bag was full of water bottles," Bar said. "From there, I went towards the cooler." When he turned to check the cooler, however, things were different. "When I opened it, I saw an old cell phone connected to a bomb with wires. It was a pipe bomb... It was immediately obvious to me that this was a bomb filled with explosives... I don't know which explosives, and I don't want to guess wrong. I threw it into the water. Then I saw a group of children in the water nearby, and hurried to get them out of the water. Then I ran to the beach and called the police." Bar explained that he and the beach's manager, Eitan, cordoned off the area until the bomb squad arrived. "I was really scared, I'm still shaking. They're searching the area right now, and the rest is the police's business. My heart is still pounding. I'm glad it ended this way." Swim school principal Gil Horowitz, who was with a group of campers at the time, said, "We were with a camp and suddenly the lifeguard arrived and told us there was a suspicious object. At first we thought it was an exercise, but when we understood it was real, we took the children out of the water, and gathered them on the beach." "Later, we understood that there had been a pipe bomb floating in the water, which was supposed to blow up whoever opened it. We saw the box and ignored it. I want to praise the lifeguards' work, they did an amazing job and they definitely saved lives. "It was a miracle - if one of the children had reached the cooler, he would have opened it out of curiosity and ti could have blown up." According to Israel Police, the object seemed to be a bomb and was taken to be destroyed. A search for similar objects revealed no other explosives. Police suspect the bomb may have floated southwards from Lebanon.